Democrats Plan Another Rebuke Of Ilhan Omar Over Comments Viewed As Anti-Semitic Senior Democratic lawmakers are again criticizing the freshman Minnesota Democrat for rhetoric that plays on anti-Semitic tropes. This time, the congresswoman is refusing to apologize. 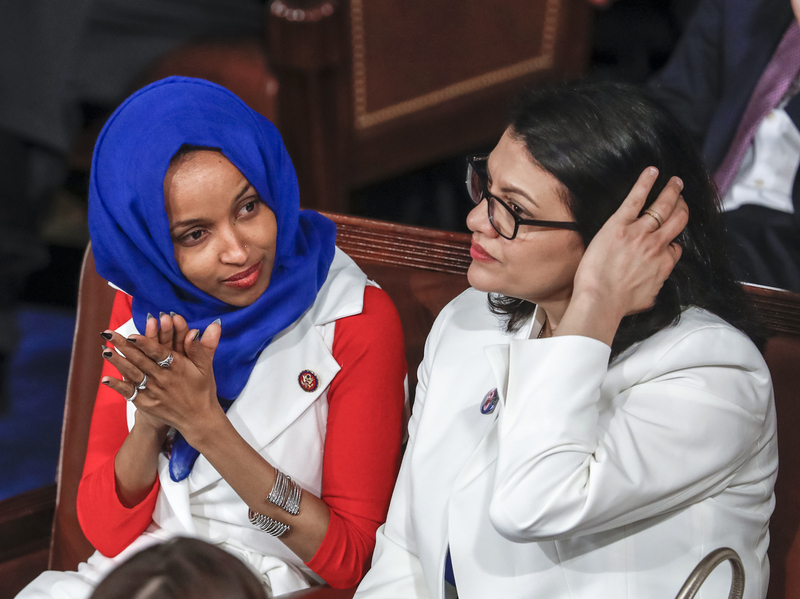 Rep. Ilhan Omar, D-Minn., (left) and Rep. Rashida Tlaib, D-Mich., listen to President Trump's State of the Union speech on Feb. 5. The infighting among Democrats has largely played out on social media, but this time the Minnesota Democrat is pushing back against her colleagues who say she should apologize and change her tone. The latest controversy follows comments Omar made at an event last Wednesday at Busboys and Poets, a politically minded coffee shop and restaurant chain in Washington, D.C., that held a "progressive town hall" with Omar and fellow freshman Rep. Rashida Tlaib, D-Mich. The duo are the first Muslim women to serve in Congress. Rep. Pramila Jayapal, D-Wash., and Rep. Mark Pocan, D-Wis., also attended the town hall. "I want to talk about the political influence in this country that says it is OK to push for allegiance to a foreign country," Omar said at the event. The statement has sparked a furious response from senior Democrats and Jewish groups. House Foreign Affairs Committee Chairman Eliot Engel, D-N.Y., who is Jewish, called it "a vile anti-Semitic slur." Engel has not called for Omar's removal from his panel, as some House Republicans have done. House Appropriations Committee Chairwoman Nita Lowey, D-N.Y., tweeted criticism of Omar's comments in which she called on Omar to apologize because "lawmakers must be able to debate w/o prejudice or bigotry." Omar responded to Lowey on Twitter by saying she "should not be expected to have allegiance/pledge support to a foreign country in order to serve my country in Congress or serve on committee. The people of the 5th elected me to serve their interest. I am sure we agree on that!" "I have not mischaracterized our relationship with Israel, I have questioned it and that has been clear from my end," she added. On Monday, Jonathan Greenblatt, the head of the Anti-Defamation League, wrote a letter to House Speaker Nancy Pelosi, D-Calif., regarding Omar's latest comments and asked for another House resolution to condemn anti-Semitism. "Accusing Jews of having allegiance to a foreign government has long been a vile anti-Semitic slur that has been used to harass, marginalize, and persecute the Jewish people for centuries," wrote Greenblatt. The House voted 424-0 last month on a Republican motion to condemn anti-Semitism following a controversy over Omar's tweets in which she suggested lawmakers support Israel only because of Jewish lobbying influence and money. Omar apologized for the tweets. She and her supporters maintain that she is criticizing U.S. and Israeli foreign policies, not Jewish people or their faith, but her rhetoric has inflamed colleagues in the Democratic Caucus and given political ammunition to her Republican opponents. The latest controversy comes as Omar was the subject of an Islamophobic attack in West Virginia's state house where a poster on display for a Republican Party event linked the congresswoman to the Sept. 11, 2001, terrorist attacks. The state party and GOP statehouse leaders condemned the sign. "The West Virginia Republican Party does not approve, condone, or support hate speech," state Republican Party Chairwoman Melody Potter said in a statement. "One of the exhibitors at our West Virginia Republican Party Day at the Capitol displayed a sign that we did not approve, were not aware of before the day started, and we do not support."